I do, however, have an unfortunate confession to make. I recently bit off all of my nails. Strangely enough, I bit off one hand of nails, and did not bite the other until about four days later. I'm very sad to have ended such a long streak of no biting, but it is just a small setback in my road to nail biting recovery. I am still much better than I was before this blog! Now on to some nails for you all. These are the last pictures of my nails when they were long, back before The Great Break, which was followed by my falling off the wagon. They will hopefully look like this again soon! 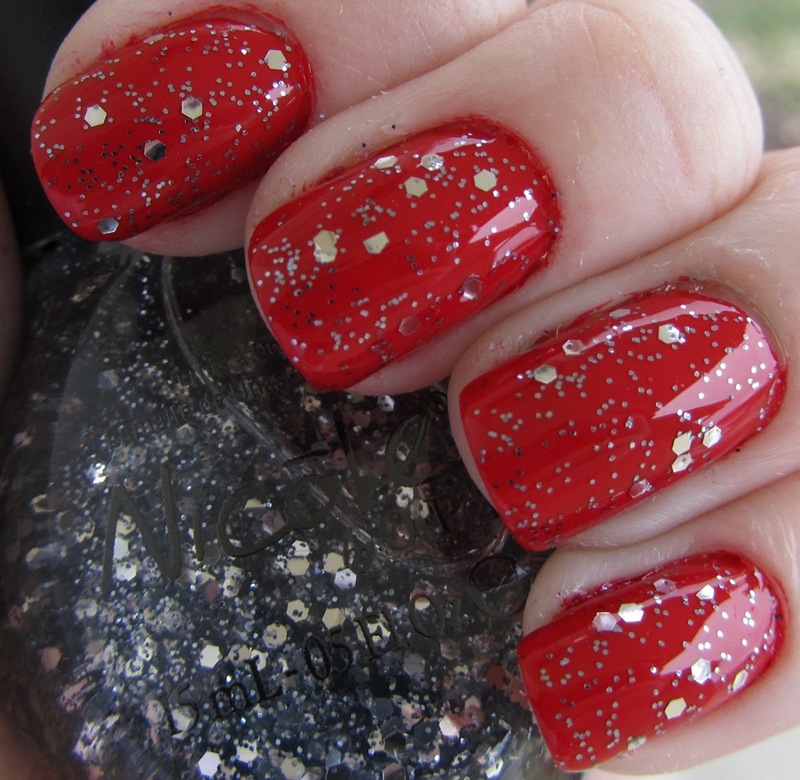 This is the gorgeous Zoya Caitlin, from the Intimate collection. Fabulous purple-gray creme. Great formula on this one as well - I am fairly sure this was two coats but this was like a month ago and I can't find the post-it I wrote it down on. Went on super smooth just like I have come to expect from Zoya cremes! This is a really nice color - lighter than its fall cousin Kelly. I added a very basic little floral pattern here with Konad Special White and Bundle Monster plate BM10. I thought this basic white design looked really nice on the medium gray creme. Oh how I miss those long nails! 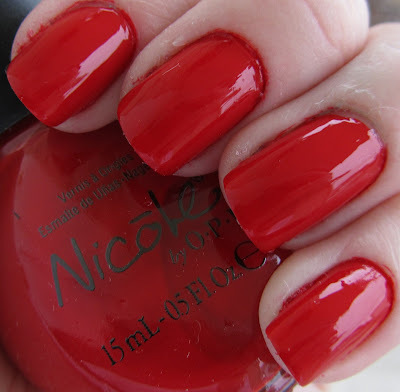 I am happy to finally be able to share with you all the second half of the Justin Bieber "One Less Lonely Girl" collection, from Nicole by OPI! While the first half was full of glittery shimmery polishes, this half has quite a few nice cremes in it - as well as some sparkle! Each polish is shown with no base coat, with top coat. I love the color on this one - a really pretty mint green, perfect for spring. This is three coats - I actually had a tiny bit of problems with this one being a bit streaky. But overall it evened out well and I probably could have gotten away with one coat if I had been a bit more... skilled, haha. Overall really loving this one though, the color is just gorgeous. Light blue is one of my favorite colors so this was a winner for me as well. Another great creme, three coats here - similar to My Lifesaver except I didn't have any application problems with this one. Went on nice and smooth! Kind of reminds me a bit of OPI's What's With The Cattitude, I may have to do a comparison later. A very nice bright red creme polish. Probably has several dupes somewhere out there... but this had really nice formula on it. No streaky problems, nice and smooth and fast dry time! This is three coats. So when I was swatching these I was a bit pressed for time, and rather than show you the glitter over every color I only have it over one (sorry about that). However, it is am amazing glitter! 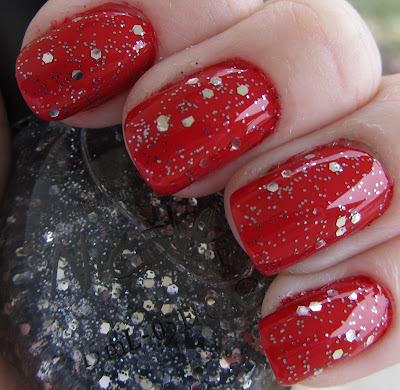 It reminds me a bit of a Deborah Lippmann glitter. Gorgeous silver large hex and small glitters... I think I am going to love this as a top coat! This is two coats shown. Very pretty. Another pretty creme polish - this time bright green. I wouldn't quite call this lime green, though. More like... sour apple green? Very nice color, same great application as Redy to Runaway Love - three coats. This one does stain a bit if you do not wear abase coat, so I recommend it! A nice gold foil. 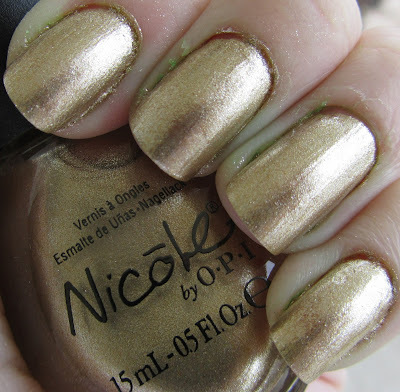 Reminds me of the Nicole by OPI Liquid Metals collection - perhaps I will have to compare this to the gold from that collection? This went on smooth - showing two coats. This is a shimmery dark plum polish, which has a bit of a pink shimmer to it. This was two thin coats, but I think it could have probably used a third, as you can see some slightly thin spots to it. Really nice dark polish, I liked this one a lot. 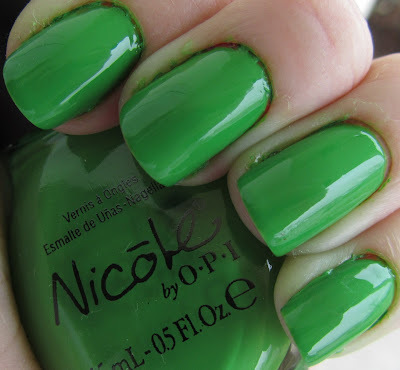 Like many of you, when I very first heard of a collaboration between Nicole by OPI and the Biebs, I was a big pessimistic... however I find the entire collection (including the first part) to be a great overall collection. This half includes some really gorgeous cremes, which I love to wear and always feel like I'm getting back to a basic polish color, which is refreshing. My stand-out favorites here are the purple, mint, and light blue cremes, as well as the glitter topcoat. I am a "Belieber" in this collection! And now on to the winners! Winners were decided using Random.org random number generator. The first prize winner, with an entry number of 46, and winner of the first prize, is... MJ, from the blog Just Some Nails By MJ. Congratulations!! The second winner, with an entry number of 473, and winner of the second prize, is... Natalie, from the blog Natalie's Nails. Congratulations!! Thank you all so much for entering this giveaway, I have another smaller giveaway coming up within the week so look for it! Things have still been a little crazy lately here, but I promise to get back on track with posting! Unfortunately, I also had a really nasty nail break yesterday... which lead to the total dissolution of my nail biting promise. After biting a couple of other nails off I quickly rushed to my campus bookstore, bought some nail clippers and clipped the rest off, to avoid biting them. So sad... now I have itty bitty nubbins. They will grow back eventually though! Gorgeous medium blue full of holographic glitter - I love this one! This was three coats, although two probably would have been plenty. This was not really very bumpy, and removed very easily, for a glitter - I was very impressed. 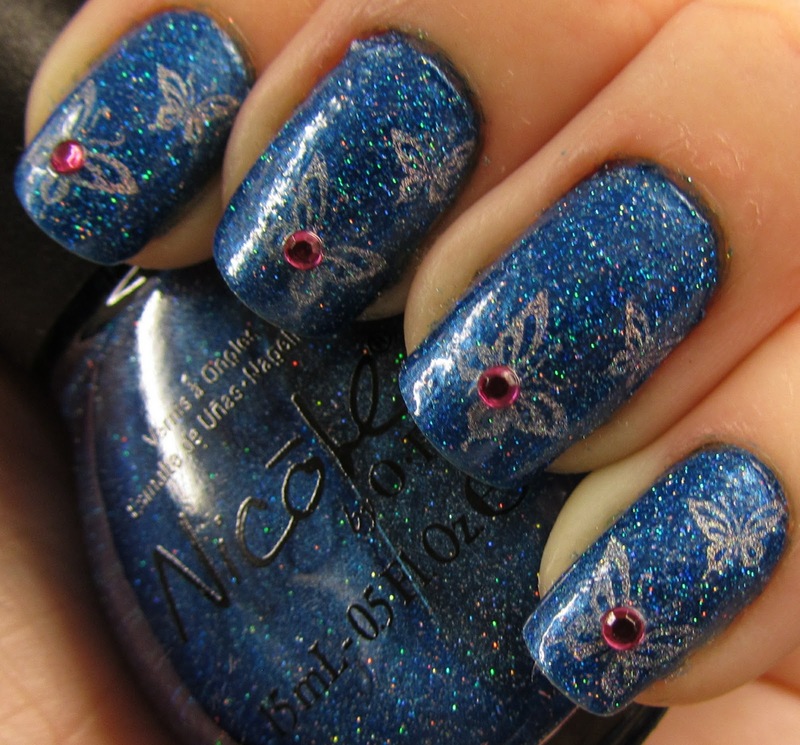 For the design, I added the butterflies using Color Club Worth the Risque and Konad plate m78. I added small pink rhinestones to the center of the large butterflies!